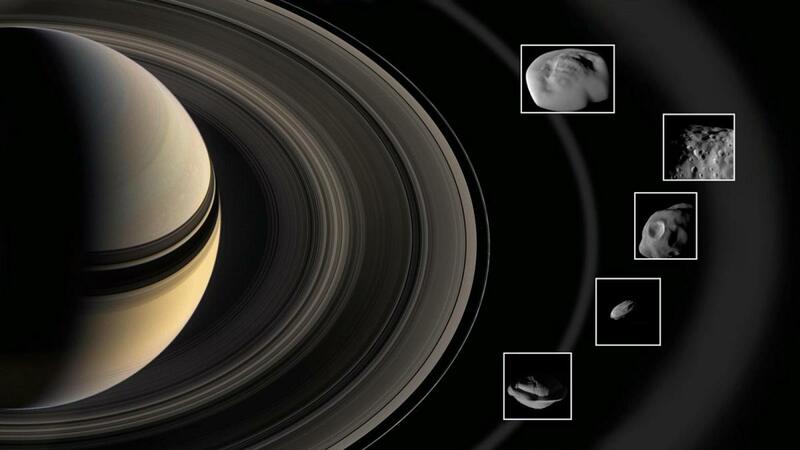 NASA's Cassini spacecraft, which conducted closest-ever flybys of Saturn, beamed back detailed images of tiny moons which resemble raviolis nestled in the planet's rings. Saturn's rings and icy particles blasting out of the planet's larger moon Enceladus.
" moons let us peer into how they interact with Saturn's rings, "said Bonnie Buratti or NASA's Jet Propulsion Laboratory in the US.
" said Buratti, who led the team. The porosity also helps explain their shape: Rather than being spherical, they are blobby and ravioli-like, with material stuck around their equators. "From a ring to the little skirts around their equators," said said. "The body would be more ball-shaped because gravity would pull the material into," he said. "Perhaps this process is going on throughout the rings, and the largest ring particles are also accreting ring material around them. Detailed views of these tiny ring moons may tell us more about the behavior of the ring particles themselves, "said Cassini Project Scientist Linda Spilker, also at JPL. Of the satellites, the surfaces of those closest to Saturn – Daphnis and Pan – are the most altered by ring materials. The key puzzle piece was a data set from Cassini's Visible and Infrared Mapping Spectrometer (VIMS), which was collected lightly to the human eye and also infrared light of longer wavelengths. The six uber-close flybys of the ring moons, performed between December 2016 and April 2017, engaged all of Cassini's optical remote sensing instruments that study the electromagnetic spectrum. They worked alongside the instruments th at the dust, plasma and magnetic fields and how they interact with the moons. Questions remain, including what triggered the moons to form. Scientists will use the new data to model scenarios and may apply the insights to small moons around other planets and possibly even to asteroids.